If you are in an accident that is not your fault, you don’t have to rely on your own insurance company to replace your helmet and kit, provide a courtesy motorcycle, which is delivered when and where you want it. 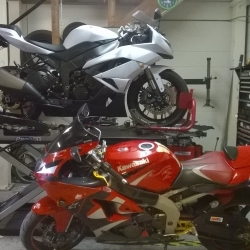 More importantly, here at S&G Motorcycles we can have your motorcycle repaired. In some of the most extreme cases your motorcycle may be deemed a write-off, if that is the case you will receive a cheque for the motorcycles Pre-Accident Value, and you will also get the option to keep the bike! S&G Motorcycles specialise in all aspects of motorcycle, scooter & moped accidents from start to finish saving you the hassle and inconvenience of dealing with all the phone calls and communication with your insurer and other third parties. We will manage your claim and do all the hard work for you so it is problem free for you and all costs will be recovered through the third party’s insurance. We are insurance approved repairers with lots of experience dealing with crash repairs and have many satisfied customers. Repairs are completed to the highest standards using OEM parts. If you have had an accident or need any advise call S&G Motorcycles or use the “contact us” page.